Tony Romano’s Playtime is a conduit of action. 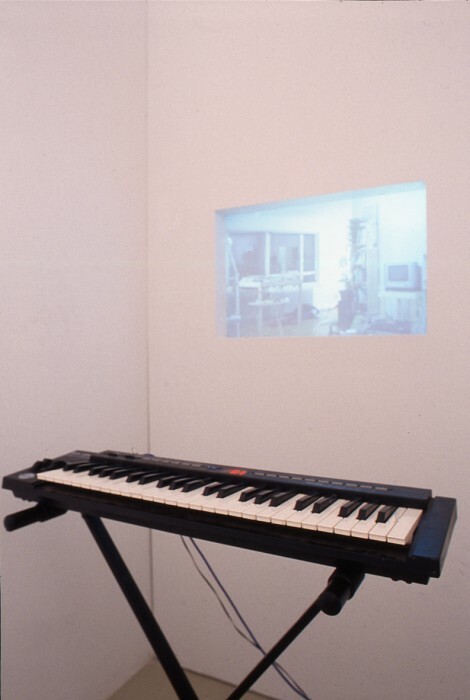 It has a public interface in which a viewer is needed to set a series of video stills in motion. In each still Romano makes a different gesture: extending or folding his arm, kicking a leg, squatting slightly or nodding his head. Yet the shift between images is subtle, emphasizing the homogeneity of each frame, as the main site of action which is only visible as hazy reflections in a darkened window. 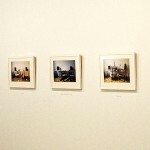 Romano also uses this repetitive sameness in “Songs of Love and Ornament”, a photo series in which Romano stacks his sound equipment in different configurations. The assembled components in their various formations mimic an architectural framework — an architecture of sound so to speak. The similarity between the modular forms, the repeated location and static position of the camera causes the appearance of uniformity from photograph to photograph. But this play with sameness is just one locus point and a means to create a pause — one that hopefully leads to a retracing — where a step back feels like one forward. Tony Romano’s Playtime is a conduit of action. It has a public interface in which a viewer is needed to set a series of video stills in motion. 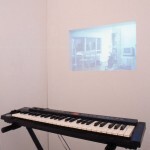 Tucked behind a wall in a small constructed nook sits an electronic keyboard, which is connected to a back-projected image. The image remains motionless until someone touches one of the keys, with each key on the board programmed to prompt a different video still. The shift between images is subtle. 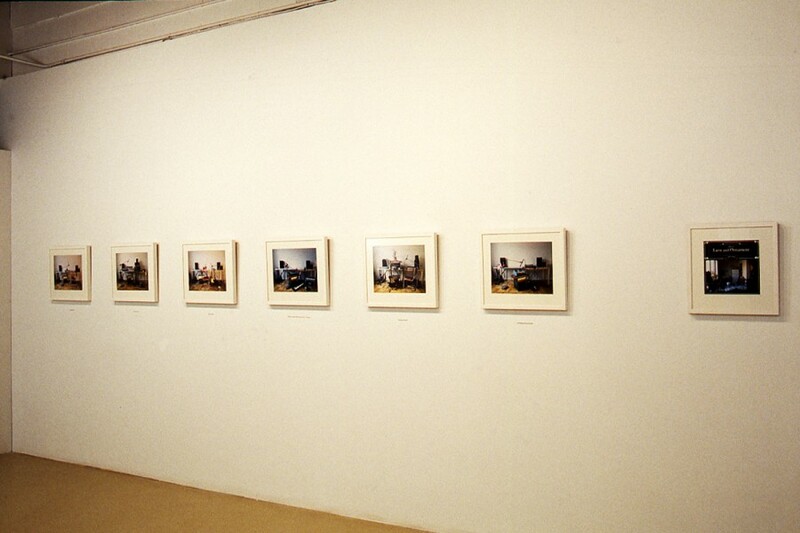 Each frame contains the same shot of an interior space of the artist’s apartment. The camera is placed at an odd angle that crosses a diagonal, and seems to be focusing on nothing in particular. The main light source comes from around a corner, indicating that that is where the action is occurring. Behind the same wall, at the edge of the corner, subtle variances in the homogeneous scenes become visible between the video stills as an arm or leg periodically juts out into view. But the real locus of action is captured by the reflection in the facing window. The window is unadorned and made reflective by the night sky, revealing a hazy image of the artist standing with his back to the wall and looking at his reflection. In each video still Romano makes a different gesture: extending or folding his arm, kicking a leg, squatting slightly or nodding his head. Each key relates to a different pose. Play the keyboard and it is as if you’re making the artist dance. The viewer’s nearly comically control over the artist’s movements is lessened by the camera’s distance angle, the dim lighting and the shadow-like form of his reflection. This lack of a point of convergence makes it difficult to locate where to direct your focus and from what you should be deriving the gist of information. Romano’s presence is almost insignificant. This deferral of attention away from the subject is emphasized by the homogeneity of each frame, drawing attention back to the scene, and to his reflected image, which is just another part of the setting. But since the reflection is where you see most of the subject’s movements, a question is raised as to whether or not it is relegated to the setting or to the action. This enigmatic and somewhat disorienting play with the reflected image is reminiscent of Jacques Tati’s film Playtime from which Romano derives the title of his piece. For the film, Tati built an elaborate set of glass architectural structures, modeled after ubiquitous modernist office buildings and skyscrapers. These structures were fabricated on wheels so they could easily be rearranged to create an endless cityscape that looked slightly different, yet almost the same. The subtle shift in background from scene to scene was disorienting both on and off the screen, which was further heightened by Tati’s use of the reflected image as a foreground of action. The captured reflections are fragmented images that transmit only partial information. Immediately loss occurs so you always know when viewing only the reflection that you are not seeing the full picture. As such the reflected images combined with other sites of action give too much information while at the same time a lack thereof, which is also mirrored in the uniformity of the setting. 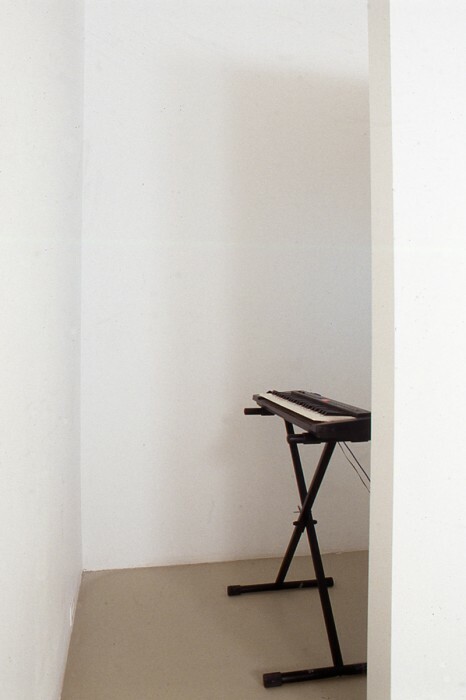 The character of Tati’s moving architecture also resonates in Songs of Love and Ornament, a photo series in which Romano stacks his sound equipment in different configurations. The assembled components in their various formations mimic an architectural framework. 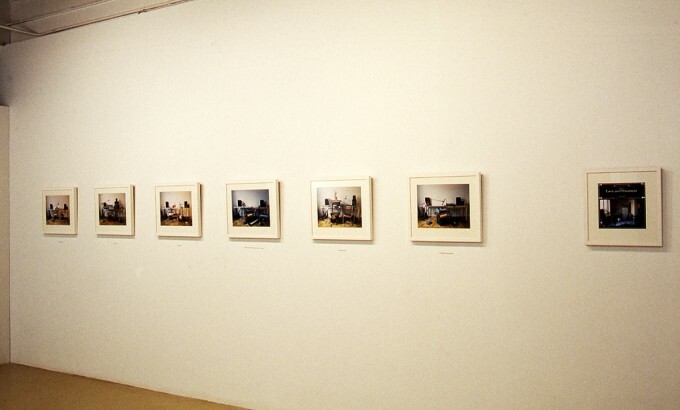 The similarity between the modular forms, the repeated location and static position of the camera causes the appearance of uniformity from photograph to photograph. Again, Romano uses a repetitive sameness that disorients and distracts through its own monotony. It is a means of gaining control. 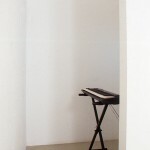 In Romano’s Playtime he offers the viewer an endless array of combinations, but no matter how fast they play the keyboard, or in what combination, their efforts have little effect. Like the formations created by his sound system, there are numerous choices but really the builder’s options are limited. Control is taken back by monotony-a repetition of faint differences that the viewer can’t possibly create or witness in a single viewing. The works have a physical presence and a defined aesthetic, but first impressions are only one element of a larger system of meaning. The immediacy of Leckey’s monolithic sculpture and blasting soundtrack is ominous in itself, but its energy is derived from moments of activation. The simple gesture of pressing a key and the immediate gratification of making the image move in Romano’s keyboard-controlled video gives way to a network of connections both material and conceptual. At this point in time, I doubt anyone expects a work to reveal all its meaning through the immediacy of its formal presence. But there is something particular in the way that both Leckey and Romano build meaning by handing over their work to others in a balance of free reign and set restriction.